Join me and the other artists at Art Explosion, 744 Alabama SF Ca for two days of open studios! Ill be in Studio 354 on the third floor. Note: The gallery is closed on Mondays and Tuesdays starting in January. Tons of great artists studios - all will be open to the public - Unfortunately I will not be present in the Studio this time around but my new Bayscapes and Fogscapes will be on view in the main gallery area on the third floor. Come visit this sweet Italian bistro at 1434 18th St in Potrero Hill. They have great food and walls filled with paintings by none other than yours truly. They are open every day for lunch and dinner and brunch on Saturday and Sunday. Bid on over 100 hand-selected artworks in diverse styles and mediums from local artists in silent and live auctions. Click here to preview the artwork that will be up for bid! Enjoy an open bar featuring creative cocktails served by Odd Job and hors d'oeuvres prepared byMacadamia Events & Catering. Proceeds directly benefit all of ArtSpan's programs, which cultivate a vibrant, accessible, and world-classart community in San Francisco. Come see this year's rendition of my annual red school painting, which will be offered at auction to benefit everyone's favorite preschool. The event will feature drinks, dancing, refreshments and the chance to bid on a plethora of cool items. Tickets are $10.00. For more info see http://www.miraloma.org/winter-social. I'm pleased to be participating in the "Impulse" Bay Area Juried Exhibition at ARC Galley. Join me for the opening reception and "off the wall sale" at ARC, 1246 Folsom St. in San Francisco this Saturday, January 16 from 7-10 pm. The show will be open through January 30th. Gallery hours are Wednesdays and Thursdays 1-6pm and Saturdays 12-3pm. There will be a closing reception and "last chance sale" on Saturday January 30th from1-3pm. In the words of the show's curators, the exhibit considers the idea of "Impulse - A spur of the moment, unplanned decision to buy, made just before a purchase. What triggers your impulse to buy something? Emotions and feelings are triggered by image, color, memory. It is a feeling of 'I must have this, I must own this.' The exhibit features works that hit the sweet spot for consumers, works of art at reasonable price points, small, amazing works that collectors will want to own. We are looking to create art addicts." So come test your resolve or submit to your hearts desire! Final Day of the 2015 SF Open Studios! I will be there all day. Day one of the final Weekend of SF open Studios! I will be in the gallery all day. 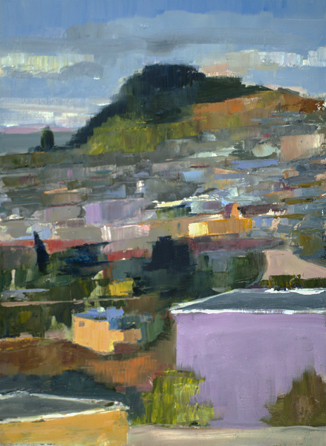 This will be the final weekend of SF open studios and the Mission will be bursting with art. I will be at Asterisk both days!